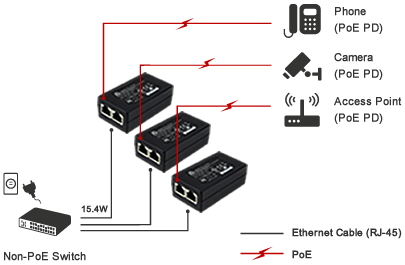 Related electronic equipment can be obtain power via Ethernet, and can be used without additional power socket, save time and money to configure power cord, cost down all devices system against.PoE is widely used in the world's RJ-45 network jack, the devices have compatibility.This technique is often also a receiver on the same cable with the power and data(although for analog data) traditional telephone network (POTS) to control.PoE Ethernet cable does not need to change the architecture to operate, so the use of PoE system not only saves wiring costs but also easy to install, on the other hand also have a remote powered, power management capabilities. Divided into PSE & PD, is the supply side and the receiving end. There are differences between AT & AF. The original of the IEEE 802.3af-2003 standard provides a machine 15.4W DC power guarantee (the minimum for 44V DC and 350mA). By IEEE 802.3at-2009 PoE standard improved, that is PoE+, can provide the electric power up to 25.5W, The 2009 standard does not allow the device to be used as the power supply of all four pairs of cables.Some vendors have announced products index contains claims 802.3 at standard-compliant products.They (purported) to achieve a high power 51W.These precuts are powered via a single cable with all four main groups other for power form the cable.These cables are Category 5 cable (CAT-5) . PSE provides 44-57 voltage, about 350Ma DC power supply, each port can provide at least 15.4W power, and after 100 meters of cable, PD client can receive must be at least 12.95W. PSE provides 50-57 voltage, about 600mA DC power supply, each port can provide at least 30W power. PoE is convenience, functionality and compatibility of technical and can be used without additional power socket, save time and money to configure power cord, cost down all devices system against.PoE is widely used in the world’s RJ-45 network jack, the devices have compatibility.